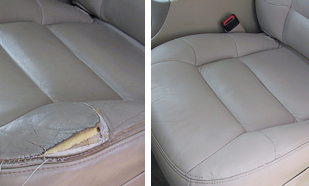 Our upholstery repair technicians can revitalize the interior of your automobile and any other upholstery as in boats, planes, or RVs, including office furniture too. These skilled craftsmen meticulously restore and repair leather to eliminate scuffs, scratches, gouges, scrapes, rips, tears and color fading, that occurs over time due to normal wear and tear. Even water damaged and fire-damaged pieces can often be repaired to like-new condition. Our expert technicians can restore your damaged items to like-new condition while providing you with significant cost savings versus replacement.